Angels can be a public eyesore! Angels from Hell or Angelic Chaos? Angel art is a global phenomenon. 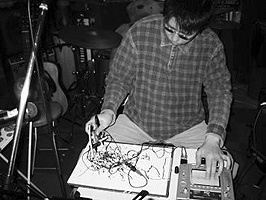 Yagihashi Tsukasa from Japan is an artist who translates ideomotoric movements and automatic drawing to music. 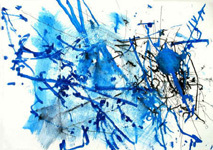 The artist performs angel drawings and music live on stage and names it Jabrec Art Music! Yagihasi is well known for his study of sacred geometry in relation to some early Hindu Mathura buddhism sculptures. 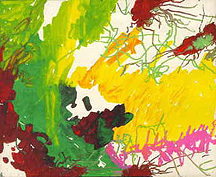 The patterns Tsukasa discovered coïncide with the patterns of automatic drawing. In 1993, Yagihashi Tsukasa had found that there were the important geometric constructions on some early Hindu Mathura buddhism sculptures. That essence is very simple and skillful. Artists in Mathura who had begun to make sculptures of Buddha were real masters. They had built up the fundamental concept spread as a important vision of Mahayana-buddhism from this age. From 1995 to 1999, Yagihashi had written 3 articles to explain about the real and the concept of Mathura art. Artists of Mathura had been knowing the most essential geometric shape. It is a rational form constructed by 8circles on geometry. Yagihashi had called this fantastic form The Shape of Flower. Yagihashi had understood that the gauge for this sculpture is more fantastic thing. It is a very beautiful form constructed by only 8 circles. This arrangement of circles is pure sacred geometry. Center points of the 5 larger external circles are vertexes of the pentagon. And the formation of the 3 inner smaller circles is the method for tracing a equilateral triangle. This shape is like an image of flower.